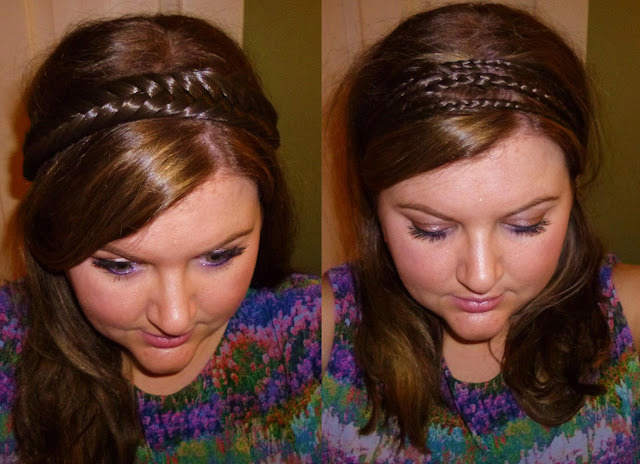 Today I wanted to tell you all about these amazing hair pieces I got from Beauty Works*. With the wedding season coming up along with holidays I thought I would talk to you about the plaited hair bands I have tried! I always get so stressed out with my hair on holiday or when it needs to behave and refuses to. That's why when I was offered the chance to try some of the hair pieces - I was excited to see how I could make use of them! For the above photos I popped the fishtail head band and festival braided hairband into loose hair but you could use these on an updo or any style as they are so versatile. What I particularly liked about them is that they have a hook at the back, kind of like a strapless bra so you don't have to do the annoying thing of pulling them over your face! The colour match on the photos looks a little dark compared to my hair, but I am planning to go a little darker so I am not too bothered - in normal lighting you can't notice that much of a difference. Beauty Works have a fab colour matching service so you can be confident that you will get the correct colour match for your hair! I was so impressed with these and I can't wait to use them on my upcoming jaunt to Marbs for my friend's hen party! I would highly recommend these hair pieces and they are very reasonably priced for a high quality item - check out Beauty Works Website for all the other products they have!